Ticking Off the Car god. My father was a strong Catholic who worshipped one God, most of the time, as long as the mechanical heap he was driving didn't get a flat, or a hole in it's radiator, or a squealing belt, a wobbly sort of frame, an oil spewing gasket. You get the picture. Dad would rationalize that our cars broke down when perhaps we had been negligent about making appropriate sacrifices to that ever lurking Car god. One who had the power to both inflict, and relieve vehicular injury. But, he also believed in the law of averages. After a run in breakdowns, he knew a good streak was due to follow, and when it arrived he enjoyed it. Often by driving too fast and picking up too many hitchhikers. He never could never pass up a fellow on the side of the road with his thumb out. This past month Keith and have been slammed with car/truck repairs and we're wondering ourselves, what have we done to tick off the car god? 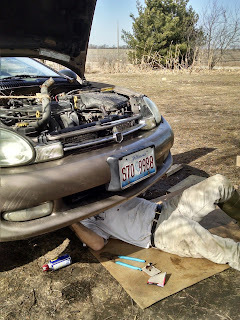 First my little car needed new brakes, then a new power steering belt. Then last week my car started spewing transmission fluid as I motored down the road. A few days later Keith's truck sputtered, coughed and gagged while he was delivering a load of hay for a friend of ours. Expenses were piling up. What could we afford to repair and what could wait? 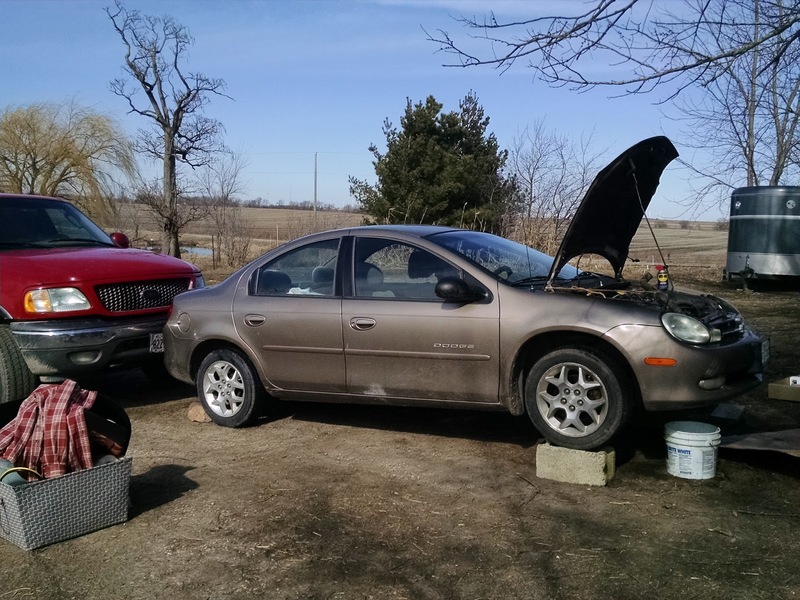 Could we dump my Dodge Neon with its 217,000 miles and just get by with Keith's fifteen year old truck? Were we healthy enough to chuck both cars and just walk the ten miles to the nearest grocery store? We decided to try our hand at mechanical repair ourselves after getting the $300 estimate to fix the transmission fluid issue on my car. Turned out hoses and a new radiator was needed. 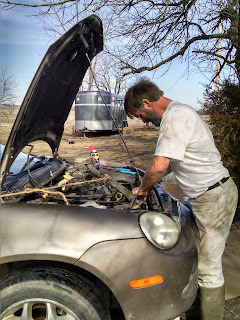 Keith has many, many talents but he is the first to admit he's not so good with engines. But he talked with our repairman, ordered the new pieces, grabbed me for assist (I am really good at holding bolts and pointing out where one doohickey doesn't look like the same doohickey we removed and now replaced) crossed his fingers, and slid himself under my car. It took us a couple hours, but we did it. 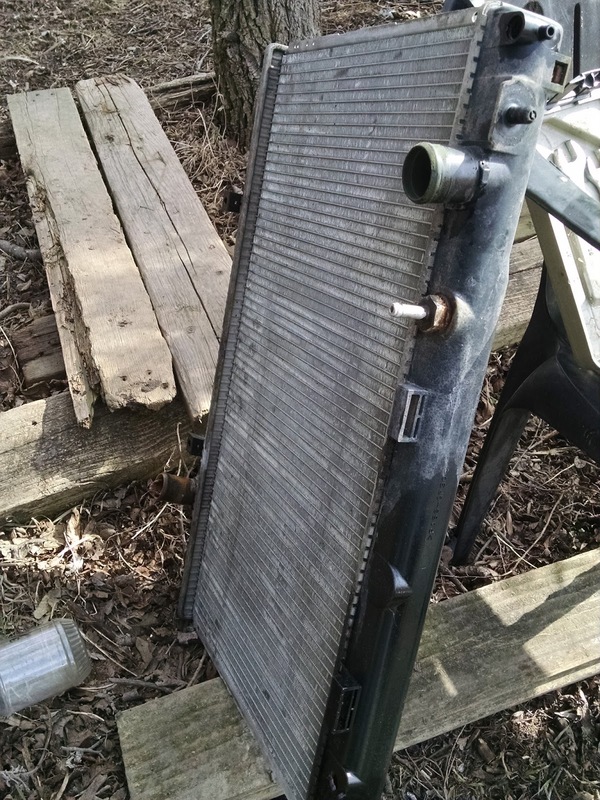 We replaced the radiator in my car, and nobody died. 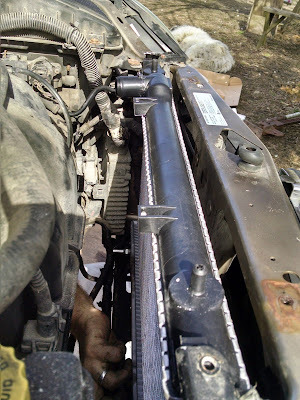 Even filled it with antifreeze AND connected all the right hoses AND replaced all the transmission fluid lost. Know what that darn car did? It ran, just great, and still is a week later. We were so fortunate that it was super warm that day, we didn't miss our old machine shed with shop quite so much. What about the truck you ask? We decided not to push our luck and took it into the garage yesterday. We'd hate to totally tick off said car god with our mechanical independence. So tell me. Who does their own car repairs? Oil changes? Tire rotations? Can you even fill the tank with gas or do you bribe the fellow at the station to do it for you? Now well into our second month of cut rate living I've realized how far we've come in regard to ridding ourselves of disposable household items. How far is that Donna? You might ask. Far. Really, really far. Like, way out there. For example, we no longer purchase any of the following: napkins, plastic baggies, aluminum foil, wax paper, parchment paper, Q-tips, hand wipes, paper towels, plastic wrap, SOS scrub pads, paper plates, cups or silverware. We did not accomplish this overnight, it took time, the real motivator was money and lack of it. 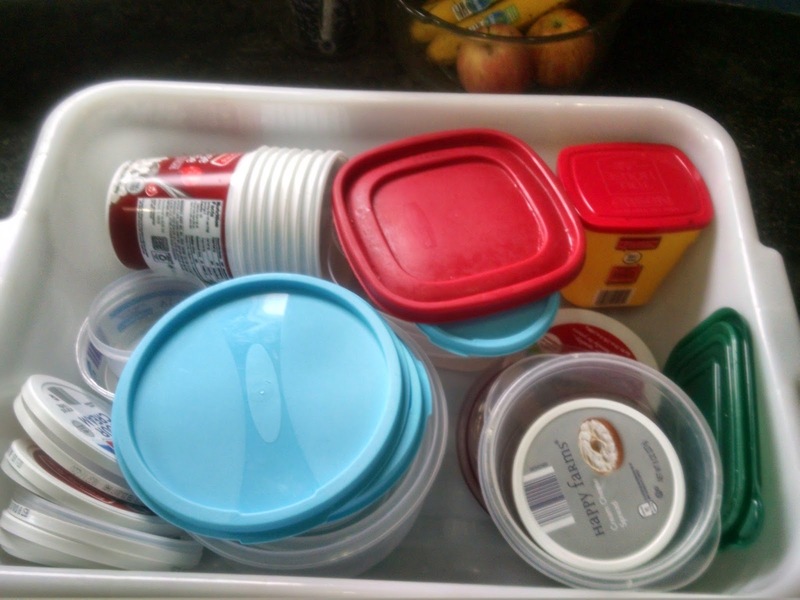 With a grocery store budget of less than $40 /week, which includes all household non-food items like cleaners and disposables, it came down to this. Did I want to spend our money on paper towels or more fresh veggies? The cucumbers and spinach won out. So here is how we get by without those items mentioned above. We use dishcloths for paper towels and napkins, we re-use plastic containers that come to us free with some of the groceries we buy (like cottage cheese), we recycle every plastic bag that comes through our door like with any packages that arrive or with any veggies or fruit we buy. I use nifty nylon scrubbies, a handmade gift this past Christmas, over and over. Like the dishcloths. they are washable. 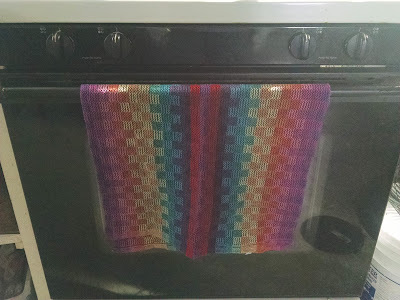 And speaking of dishcloths, the one in the pic above was made by Martha Witcher in Metamora Illinois. Handwoven and gorgeous, her items are high quality and meant to be used and washed over and over. Their durability is fantastic. Check her blog out HERE. I've also become very creative with newspaper. There are three free ones we get every week. 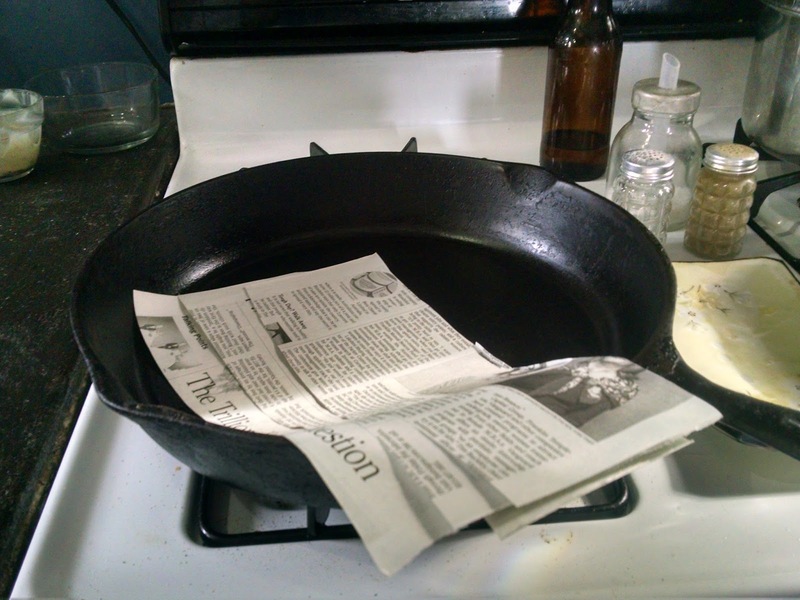 I cut them up into strips and use them to coat cast iron pans and baking wear with butter or oil, I use half sheets to wash windows and mirrors, I use whole sheets to drain greasy food like fried chicken. We never need aluminum foil since we have so many left over plastic containers to store food (and I hate the stuff) plus I use our glass canning jars to keep quite a number of things fresh in the fridge. Yes, I do wash dishes often since we don't use any disposable dishes, but it's only a matter of keeping a sink full of hot soapy water. I wash, or simply rinse, dishes as soon as I dirty them. In case you're wondering though, we still buy toilet paper, we're not complete barbarians. So, tell me what disposables you live without and what you use in their place. He looks like his surname does he not? All pale and cool, wind blown and aloof. I was reminded of dear Edgar when I was out doing chores this evening, in the cold, blowing snow. Just one of my favs of the 70's back when being cool had nothing to do with the insulated coveralls I wear now. The insulated Camouflage coveralls. Oh yeah, I'm so cool now. The fact that we got a little snow dump today is all my fault. Yesterday, when it was in the 50's I was whining about the mud, and the dreary overcast sky. I even said to Keith, "So where is all the snow this year? A little white sure would be a nice change." I was tired of looking at the yard debri and rather than spend a day picking it all up, I just wanted it covered up. 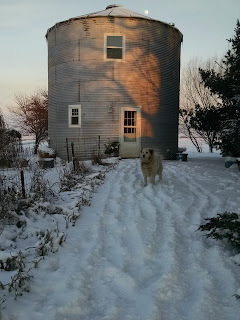 The snow started this morning and at first, was a lovely layer of powdered sugar, but by evening we had several inches. At least afterwards it brought some sunshine. Fortunately the wind was just enough to make small drifts, not too hard to walk through, but if it picks up tonight we'll have issues. In these flat plains an inch of snow, accompanied by high winds, can cause white out conditions. Which, in times past, I did not mind. I had no problems driving in bad weather, just chalk it up to years doing home nursing. But now, on our limited budget, I'm not so careless about venturing out on snowy or icy roads. What if I slide in the ditch and have to pay MONEY for someone to pull me out? Now that...would be a disaster. So, big deal, we have snow. The animals will be ok, good shelter with deep bedding is all they need, but we human mammals will whine a bit more I'm sure. All in all though the winter of 2017 has been mild here. . No long cold snaps like Illinois winters of the past, and no serious snow storms (yet). Only a couple of icy rain events. I experienced far worse in the decade I lived in the Black Hills of South Dakota. There, you could enter a restaurant at noon when the sky was clear and blue, and one buffalo burger later, find your car buried in a ten foot drift with the dreaded Jackalopes hopping back and forth over the top. Which is why any cowboy worth their salt lick would keep his snow mobile gassed up, ready to go, and secured with baling twine, in the pack of his outfit (aka pickup truck). Sometimes, especially in the plains around Belle Fourche, SD (which I still lovingly refer to as The Armpit of America ) the storms would roll in so fast, livestock would freeze where they stood. So when my fellow Land of Lincolnites complain about our tough winters, I tend to scoff. We need a milk house, desperately. A building where we can wash up all our milking equipment (which is being done in the Looney Bin now) and store all our root veggies and canned food overflow, as well as place for our freezers and an extra fridge for all our milk products like cheese and yogurt. Contrary to popular belief, a milk house is not the place where we milk our cow or shelter her. That takes place in another small cow shed. Most normal folks would use wood and drywall to build a milk house (that's how we built our first one in 1999) but no, we have to use tires. Why? wanted to do the same. 2. Before we attempt to build an entire home based on tires, we thought building a "prototype"
This build will start, we hope, in early summer. 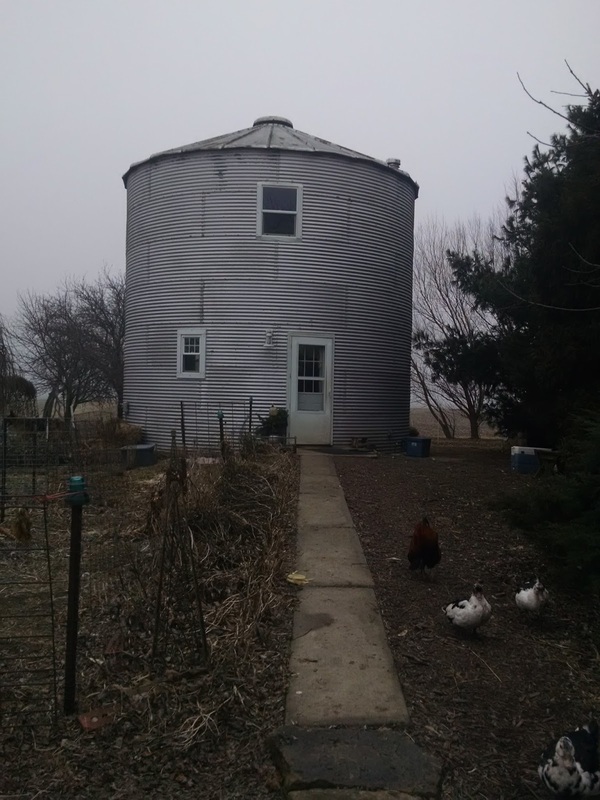 After the sale of our other farm we had a small amount left over for this build, so it's a capital expense that shouldn't affect our regular monthly budget. If we plan everything down to the littlest screw, it shouldn't. If we do the majority of the work ourselves, it shouldn't. If we don't have to pay a ton in fees and permits and waivers, it shouldn't. We have just $5000 to build a 24 by 12 foot milk house. The milk house floor plans are in flux right now, one of our sons is tweaking it on his CAD program. When he's done I'll post it here. In the meantime we have a lot of ground work to accomplish. The Illinois EPA won't allow us to build anything with tires until we complete a BUD (benefit use determination) application, not even a small doghouse. Yes, I asked. This seven page document requires us to document where the tires came from, how we plan to use them, how their use is more beneficial than conventional materials and on and on and on. We also have to work with our own county on building permits. I'll be chatting with the same guy who dealt with us on the building of our grain bin house and who is currently working with me on the permits I'll need for our family graveyard. You can imagine how thrilled he'll be to hear about this new project!